State Auto, the insurer for Clinton, Miss.-based Clinton Body Shop, confirmed late last year it wanted the collision repair facility to follow OEM procedures. 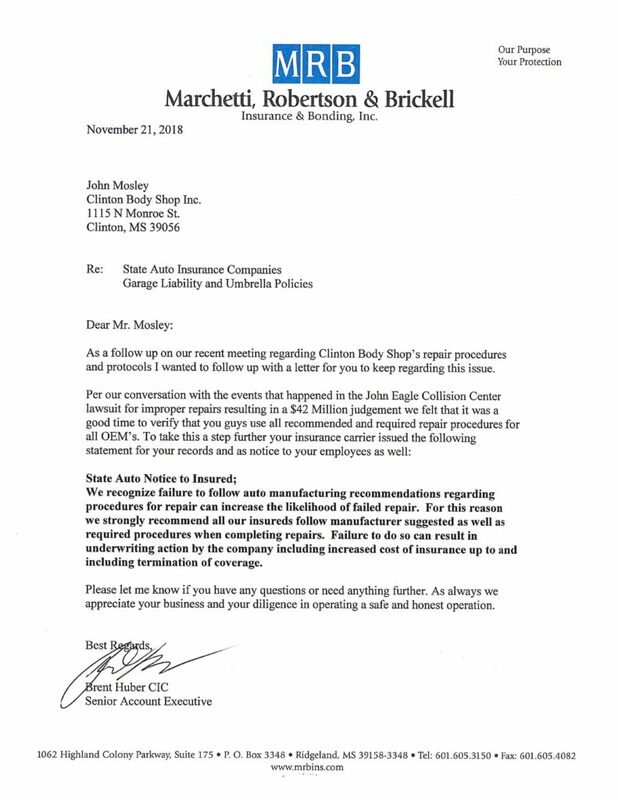 After meeting attorney Todd Tracy and following Tracy’s $31.5 million win (later settled for an undisclosed amount) against a Texas shop who failed to follow OEM repair procedures, Clinton Body Shop owner John Mosley contacted his insurance agent regarding the case. Mosley said his inquiry involved repair procedures; he hadn’t asked State Auto specifically about OEM guidance on parts. However, his shop doesn’t use recycled or aftermarket components, he said. Customers are either told to go out-of-pocket if the carriers dispute the use of OEM — which often leads to the carrier retreating and covering the cost — or Clinton Body Shop price-matches, according to Mosley. Mosley noted that the John Eagle situation could have happened to anyone, before correcting himself to observe that some shops, like his, follow repair procedures. But he also reflected that there’s much pressure from insurers to deviate from procedures. It could be good information to keep yourself protected with an affordable premium and to explain the importance of repair procedures to an insurer or customer who wants you to ignore them. In November 2018, the Colorado dealership chain Rickenbaugh Automotive Group issued an open letter declaring that its garagekeeper’s carrier, Sentry, felt as State Auto did. Pacifico said in a 2018 interview Rickenbaugh’s attorney told him that a court would indeed view the terms required and recommended as having a “similar scope.” Sentry said that to be protected under its coverage, the shop needed to follow OEM procedures “within reason,” according to Pacifico. Intrepid Direct Insurance aftermarket general manager David Willett also said last year his carrier demands all collision repair applicants be either I-CAR Gold Class or Road to Gold under certain circumstances. “If you’re not I-CAR gold, we won’t insure you,” he said in a September 2018 interview. Intrepid Direct requires the shop to pre- and post-scan all vehicles, have a quality control technique, calibrate vehicles properly, have proper equipment, and possess access to “on-demand” OEM repair procedures. Intrepid Direct’s risk would in theory diminish diminishing to factors like honest mistakes rather than sloppy, preventable ones generated by a shop’s failure to keep current and follow OEM procedures. These carriers’ views aren’t surprising. Common sense dictates that you would look for repair answers from the company whose engineers built the car and researched how it could be safely repaired. All three national collision trade groups and I-CAR have also said for years OEM instructions are the correct way to repair a vehicle. Mosley said the letter from State Auto also proved useful in spurring action on auto claims issues from the Mississippi Department of Insurance.